Online dating is a huge business, but most dating sites are still stuck in the 90s. They don’t take advantage of developments in video and social networking, and they don’t have good mobile experiences. 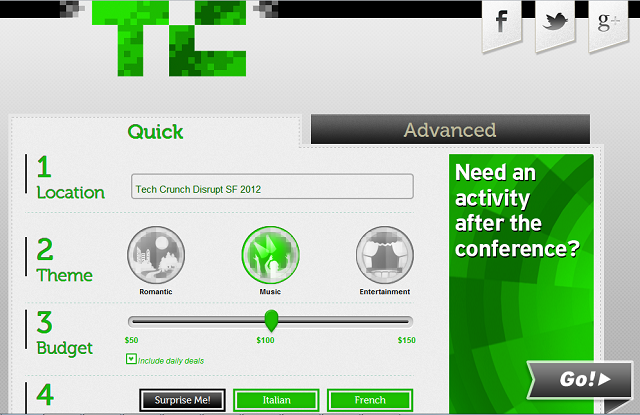 Here are a few startups I met at TechCrunch Disrupt SF that want to bring online dating into the modern era. Michael Cafferata, a firefighter, started VideoDate on the side. He says he used to use online dating sites but was always frustrated by the process. Photos and profiles go stale. “And if you go on a date with someone and there’s no chemistry, you’re still stuck trying to entertain them for the rest of the date.” Cafferata met his wife at the mall, ending his tumultuous relationship with online dating. But he still wants to solve the online dating problem. His solution: a mobile video chat app. The entire experience, including filling out your profile, happens on a mobile device. The app will try to match you with other users, and if you and another person are interested in each other, you can do a video chat. You can’t just do a video call with someone who hasn’t approved you. The app is ad supported, but Cafferata says a paid ad-free version will be released later. VideoDate is only available for mobile devices, but Cafferata says a full web version may eventually follow. Like Cafferata, Frimper co-founder Maayan Kimhi was jaded by online dating and decided to add a video component to the experience. But instead of a mobile app, the company has gone with a Facebook app. There are two main components: matching algorithms and an online “speed-dating” app getting quick impressions of the people you’ve been matched with. The speed-dating component is the catchy part, but Frimper is investing heavily on the algorithm. “Dating shouldn’t be about demographics; it should be about personality,” says co-founder Itamar Koren, who is focused on the algorithms. Both Kimhi and Koren were psychology majors in college. Prior to Frimper, Koren worked in the human resources industry. Frimper’s matching isn’t based just on what you say about yourself, but also about what other Frimper users you interact with say about you. Koren says this will give them a better ability to match you with compatible people. You might not describe yourself as shy, but if several people tag you as shy after chatting with you, that will be added to Frimper’s matching system. It’s also looking for similarities between users. “What Amazon does for books, we want to do for people,” she says. Kimhi says Frimper is dealing with the “flasher problem” in two ways. First, the app validates your profile to make sure you’re a real person. It will automatically try to determine whether you’re real or not, but in questionable cases, a human review will be necessary. At the moment it only exists as a Facebook app. It will eventually be available outside of Facebook, but users will always need to validate through some sort of social networking profile to verify that they are who they say they are. Users will also be able to report abusive members. As soon as abuse is reported, the video chat ends. Eventually Kimhi and Koren want to apply the platform to other areas, such as finding roommates, business partners, or investors. Dateini solves a different problem entirely: What do you do once you’ve already got a date? Even if you’re married or in a steady relationship, you might want to plan a date. The company provides a date-planning application that co-founder Rotem Tal describes as a virtual concierge service. You give Dateini a budget, choose a “theme” (romantic, music, or entertainment) and a good type preference, and it will autogenerate a date itinerary. Tal says all the activities will be clustered together so you don’t have to drive or catch a cab to get around. So far it’s available for the 10 largest cities in the U.S. So you’ve met someone, video dated, real-life dated and now you’re engaged. What now? Earlier this week at Disrupt, brit.co founder Brit Morin said that engineers might not want to work in the wedding industry, but pointed out that it’s a multi-billion-dollar industry. emotion.me, a wedding planning app, isn’t shying away from that opportunity.